The latest upgrade to TRIP had lots of new features easily visible to users. However, for all the external changes we have made a number of internal ones. One of the unhidden wonders has been a broken link reporter! Basically, if someone clicks on a link and it doesn’t result in a valid webpage being open we now get an email telling us the link isn’t working. Previously, we had no system for this and it was down to the goodwill of our users to let us know. When the new feature went live it was truly depressing as I was personally receiving about an email every minute. However, it soon showed up that a few particular publications were causing the bulk of the issues. Within 4 days these links were fixed – causing a 90% reduction in the error messages. Now, 3 weeks later and lots of hard work, we’ve fixed approximately 99% of all the broken links. For most people they will not notice a difference – but it’s great to know our system’s working well and long may it continue. Translate function. Users can translate the site and subsequent links into one of six languages (Spanish, Portuguese, Italian, French, German and Welsh). We’ve added the ability to restrict results to only those added in the last month. We’ve started searching one of the largest clinical trials databases. Started extracting and displaying DOIs against each result (if they exist). Included a separate section for clinical calculators. Included a separate section for social media results. The speed of the site has been improved. Started to include patient decision aids and medical education content. Massively increased our medical video offering, now searching over 6,100 videos. Feel free to let us know what you think! We’re building a TRIP app. Initially it’ll be for the Apple iPhone and if that proves successful we’ll create a version for Android. It’ll actually be multiple apps, but all following the same format – highlighting the latest content added to TRIP for a given area. 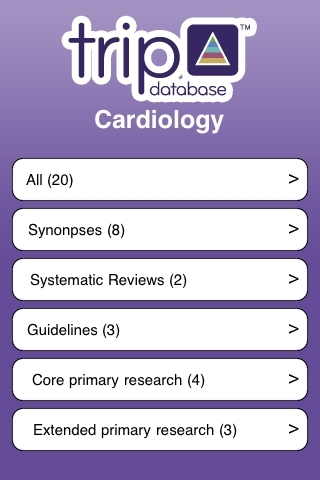 Clinical area – all the new content in areas such as cardiology, oncology etc. They’ll be around 25 of these. Individual clinical conditions – while we could produce unlimited, we’ll start with 20-30 of the biggest e.g. diabetes, asthma, hypertension. Each month users will be alerted when the new content is available and will be able to select to see content based on our filtering system (e.g. systematic reviews, guidelines) and then simply scroll through the results. Below is a screenshot from our prototype – and it’s great! We’ll have to charge for this, but it’ll be suitably cheap!